It’s not uncommon for directors to make appearances in their own work, but Thor: Ragnarok director Taika Waititi’s own cameo wasn’t actually planned. As par for the course with the upcoming film, it was totally improvised, and happened because he and Chris Hemsworth were goofing around. Hemsworth appeared on the latest episode of Jimmy Kimmel Live, armed with a clip from Thor: Ragnarok. 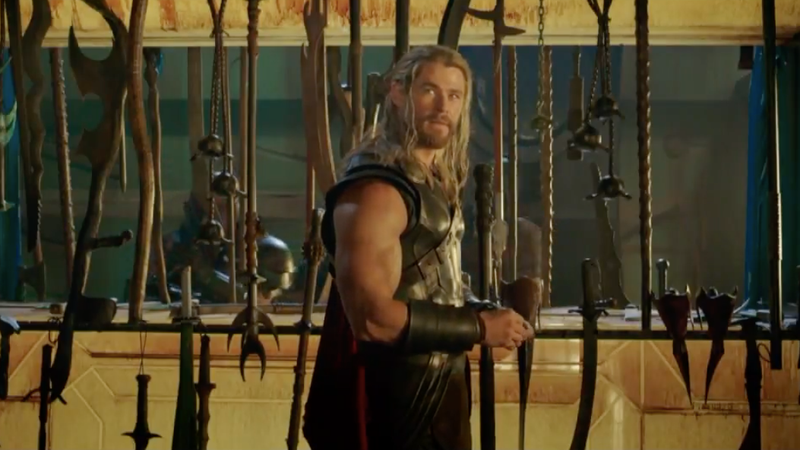 The short scene shows Thor trying out some weapons while chatting with fellow gladiator Korg (voiced by Waititi) about missing his hammer because it could do cool stuff like help him fly—something the rock monster fighter has trouble understanding. Then again, Thor isn’t exactly explaining it well. While chatting with Kimmel, Hemsworth shared that the scene was originally just one line, but they decided to add Waititi and expand it after the crew caught the two of them playing around with the prop weapons. He said the art department “just went mental” on creating the weapons, most of which are never actually used in the film, and they thought it would be fun to take some more time and show them off properly. Thor: Ragnarok comes out November 2, with lots of weapons and even more crazy improv. You can watch the clip below.